In my professional career I created marketing and communications functions for a number of big public companies and for small, VC-funded start-ups in the high-technology industry. Now I do marketing consulting work. I also write and publish science novels and short stories. 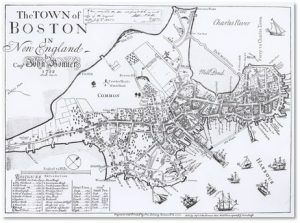 I’m a docent for Boston by Foot, giving historical and architectural walking tours of Boston. Washington Street is a common street name in many cities and towns. What patriotic citizen wouldn’t name a street after our country’s Founding Father? Boston has a Washington Street, of course. How could we not? But think about it. 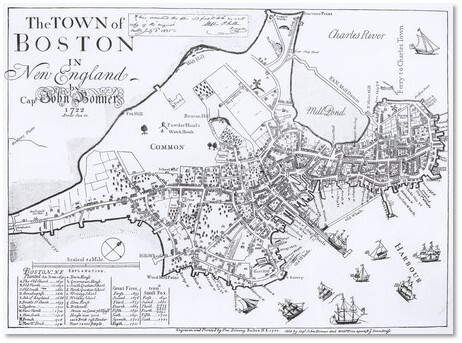 Boston was founded in 1630, over a hundred years before George Washington was born. So, what was that street called before it took on the name of our first President? To begin with, it wasn’t one long street. Washington Street also changed its names and its course over the years. Today’s Washington Street begins in Keany Square at the south end of the Charlestown Bridge, where Causeway Street and Commercial Street intersect. We now call this section North Washington Street. It ends at Haymarket Square near what is now Government Center but it was previously truncated by the no-longer-extant Scollay Square. Washington Street picks up again where Court Street becomes State Street and runs through Downtown Crossing. These blocks once held Boston’s two big department stores, Filene’s and Jordan Marsh, as well as the Jewelry Exchange Building. While the stores have changed over time, Washington Street still has a heavy commercial presence. From there, it moves through the South End across what used to be Boston Neck, the narrow isthmus that connected the Shawmut Peninsula to the mainland. In fact, Washington Street provided the only road going across the neck to Roxbury. Outside of Boston, Washington Street continues south, through multiple small towns and all the way to the Rhode Island border. Both then and now, it was an important thoroughfare—the Boston Post Road to New York City. Cornhill (Not Road or Street or Way. Saying Cornhill Street means you’re not from around here. ): Laid out in 1708 and named for London’s Cornhill, went up from Water Street to Dock Square as part of a winding road between Roxbury and Boston. In 1816 it extended to the Old South Meeting House on School Street. Marlborough Street went from the short distance (about three blocks) from School Street south to the intersection with Summer Street on the south and Winter Street on the north. Newbury Street ran another few blocks from the Summer Street/Winter Street corner south to Essex Street/Boylston Street. 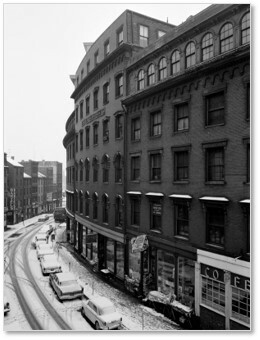 Orange Street from Essex Street/Boylston Street south to the fortification located near what is now East Berkeley Street (then Dover Street). Early maps, including Capt. John Bonner’s map of 1722, mark the road across Boston Neck as Orange Street. You can see that it must have been confusing as you traveled along a street that changes names from one block to another. It would have been a grand gesture to rename all four streets in George Washington’s name with one stroke of a quill pen. Boston tends to do things in a more piecemeal fashion, however, a pattern that continues in today’s Seaport District. 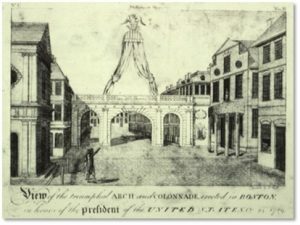 President Washington did drive over “Old Cornhill” during his visit and that portion was renamed as Washington Street in his honor. Old Cornhill returned to life as New Cornhill in 1816 when entrepreneur and developer Uriah Cotting plotted its path from Adams Square to Court Street. Even then, the name changed over time from Cheapside to Market Street and eventually to Cornhill. New Cornhill curved in a graceful way and attracted booksellers and publishers. By the mid-nineteenth century, it had become the heartbeat of Boston’s intellectual community, drawing religious, social, and political thinkers. The Brattle Book Shop began there as Burnham’s book store, William Lloyd Garrison published “The Liberator” and the first edition of Uncle Tom’s Cabin came off the presses on Cornhill. Authors included transcendentalists, philosophers and abolitionists. This section, along with the booksellers, fell to the wrecker’s ball when Government Center was created in the 1960s. Only the Sears Crescent building and the Sears Block remain to mark its curve along the south side of windswept City Hall Plaza. Royalty lost favor during the Revolutionary War. King Street became State Street and Court Street replaced Queen Street. Orange Street had already been renamed Washington Street on July 4 of 1788, before President Washington’s visit. The new name extended north to Adams Square on July 6, 1825. It was applied to a new road to Haymarket Square on November 6 of 1872. Finally, the section around Dudley Square north of Roxbury received its name on May 9, 1825. 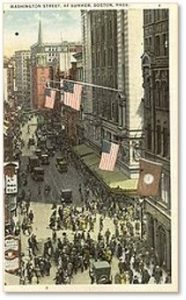 Today you can trace the path of the Old Cornhill by walking 144 feet along City Hall Plaza in front of the Sears Crescent (1816). Arthur D. Gilman recycled the Marlborough and Newbury Street names when he laid out the Back Bay grid in 1857. Orange Street appears lost to history, although one can be found in Roslindale. You can learn more about Boston’s deep literary history on Boston By Foot’s “Hub of Literary America” tour. Given regularly during the tour season, it starts at the Old South Meeting House, which is located on, where else, Washington Street.